I have been an unabashed organic marketer for the last decade. I started by blogging in the early 2000s, then went deep into front end development in university, and fell into SEO around 2009. I’ve always loved the organic side of marketing, getting to dig into why things rank (or don’t), and how to work well with the algorithms to help them accomplish their goal of surfacing the best results for each individual query. Like many clients I’ve worked with though, I find that SEO can take a fair bit of time to start working. Sometimes, it feels too long even when you know exactly what you need to do in order to rank and drive that traffic. This was an average of 6.5 “leads” per day, where a lead is an email address. So I started wondering how to get more while also keeping quality high. So over the course of this year I’ve spent ~$7,000 while learning the ropes of acquisition, everything from Google Ads to Facebook, Instagram, and even Quora. On average since April 18, we’ve accelerated that to 7.13 per day even during summer months. That might not seem like a big jump, but it is an extra 221 “leads” per year. That’s meaningful to a business like Credo. I didn’t start investing in any real paid acquisition for more than two years after I started working on Credo full time. But as you can see, we had some big jumps in subscribers as well. So why was this the right time to start? And when should you think about investing in paid acquisition, whether it’s your company or as a head of marketing/marketing manager? Per usual in the business world, it depends. So let’s dig in. What’s your approach to customer acquisition? Let’s get philosophical for a bit. What is your approach to customer acquisition? Meaning, what kind of acquisition makes the most sense for your company within your vertical, with the team that you have, and the type of customers that you need to attract? Your acquisition channels should be in line with your business. If your business is one of high volume yet low margin transactions, your user acquisition (and retention!) programs are going to look very different from a business that deals with very few deals per year but each being worth a lot of money. An example of the first kind of company is an ecommerce company. Say you’re selling $29 tee shirts. In reality, you need to sell a lot of tee shirts and in order to make a margin you need to make up for it in volume. Unless you have a lot of upfront capital, you also need to make that customer profitable quickly. Your upfront acquisition costs need to be as low as possible. At an average $4 per click and a $29 shirt, you need to convert 14% of those clicks (1 in 7) to make advertising profitable. Most ecommerce companies I know aren’t doing anywhere near that level of conversion, so it’s going to be very hard to make it profitable. But what if you could rank #1 for “custom tshirt”? It has 6,600 searches per month (on average) according to SEMrush, though according to Ahrefs there are an average of 12k searches per month and 13k clicks, which means that some searchers click on more than one result. 57% of those clicks go to organic, which totals 7,410 organic clicks per month. If you rank #1 organically and position 1 gets 20% of the clicks (which is maybe a bit low), then your site will receive ~1500 clicks for that term each month. That’s likely a much better return for you than paid acquisition. On the other hand, think about a custom web development agency where an average project can be worth north of $100,000 for a full website and custom application. I’ve heard of these going north of $500,00 to an agency. Do you think a custom development agency can acquire a $500,000 client for the same amount that a custom tee shirt company can acquire a customer? Even at an average of $4/click, you can get 10,000 of those before a lead starts becoming potentially unprofitable. But the reality is, a truly effective marketing strategy has a mix of channels! 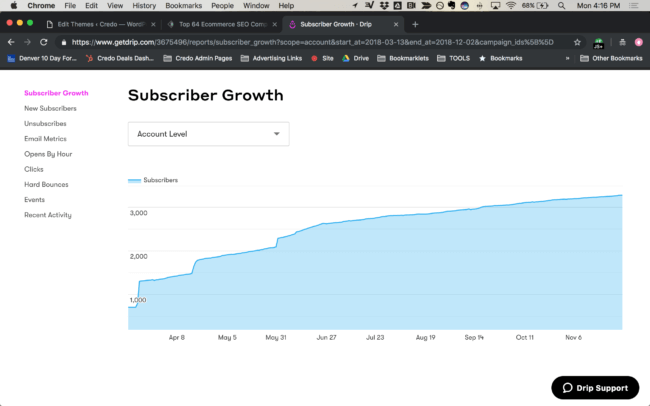 When getting the business off the ground, the founding team probably focuses on one channel to build a sustainable business and then layers on other channels, but eventually you’ll tap out that one channel or need to grow even faster. Even HubSpot, the bastion of and creator of “inbound marketing”, has changed their tune on digital advertising. When does paying to acquire directly make sense? Paid acquisition across platforms like Facebook, Google, Bing, Instagram, etc is a huge industry. Present day, Facebook makes ~$131.7M per day from their advertising platform. As an organic marketer where I can drive a lot more targeted traffic than paid, and usually at a much higher conversion rate and cheaper CPA, this amazes me. Organic gets a small percentage of the budget that paid does, yet organic done correctly makes up an outsized portion of traffic and revenue. That said, it can absolutely make sense to pay to acquire users. I wrote before about why starting with a small budget, if you have a larger one, isn’t the right approach but this discussion goes deeper. In my experience working across a lot of companies as a consultant and also in-house for a company with a nine figure marketing budget (seriously), the paid marketers get the huge budget and the organic marketers very little comparatively. So when does it make sense to invest in paid acquisition at your company? We’ll get to that, but first we need to get clear on what we are paying to acquire. What are you acquiring, exactly? “Paid acquisition” can mean a lot of things, similar to a term like “search engine optimization” or even “lead generation”. What are you acquiring? What kind of business are you optimizing, in what vertical? What is a “lead” anyway? Before you start paying to acquire anything, you must be clear on what you are acquiring and how that maps into business growth. Unless your business triages traffic to monetize it, we’re not paying for traffic alone. If the KPI your boss looks at is raw traffic, then you likely need to reset expectations (unless raw PVs is what drives revenue). Mass top of funnel traffic that you then cookie and retarget via different campaigns meant to convert. Before you start paying to acquire anything, you must be absolutely clear on what it is you are acquiring and why. The “should I invest in paid marketing now?” question is never straightforward, but there are a few questions to ask yourself before making the decision. Do I have a clear picture of how I will monetize, or think I will monetize, the traffic I acquire? Do I have enough budget to buy enough traffic to know how well it is converting into my main objective? Do I have the expertise I need to run these campaigns properly and as efficiently as possible? We’ve already covered the first point above, with becoming crystal clear on what exactly you are acquiring. Let’s briefly cover the next two. Paid marketing, like anything, is an investment that you must measure carefully to know if you are achieving a return. Whether that’s ROI (return on full investment) or ROAS (return on ad spend), you have to measure everything from spend and costs incurred (people, software, etc) to conversions and conversion value, wherever that is best measured. At Credo, we do not recommend starting small and scaling up at least how many talk about that. Usually when we speak with companies who are just getting started with their paid acquisition, they want to spend too small of an amount over time to “learn”. Instead, they would be much better advised to spend that chunk of cash (or to go save or redistribute other funds to achieve that chunk of cash) upfront much quicker to learn much faster whether their campaigns as currently conceived will be profitable for their business. “Starting small” is absolutely fine if you mean that you want to put enough budget towards the campaigns to truly know if they will work. No one wants to, or should, spend more than they need to. Create effective ad creatives (images, videos, etc). Obviously the goal of paid acquisition is ultimately to acquire visitors/customers quicker than through a channel like SEO and to make them profitable. Profitable is when you make more revenue from that customer than it cost to acquire them. Finally, if you are clear on what you are trying to acquire (and why) and you have good budget earmarked (if you want to gauge how much you should expect to pay, Clarity.fm has some very good PPC/SEM experts available by the minute), then you should ask yourself honestly if you have the expertise personally to effective run the campaigns and to know if they will work. First, I staunchly believe that you should have a base level of knowledge about a marketing before you hire someone else to run it for you, whether in-house full time or an outside marketing company. If you have not yet done the work to understand the basics of PPC and social advertising, then I highly recommend that you do so. Even a base level of knowledge from the right sources (I highly recommend PPC Hero for SEM and Jon Loomer’s stuff for Facebook Ads) can help you avoid being taken for a ride by illicit gurus. Of course, you can always contact us to help you with connecting with the right providers as well. Secondly, take into account if running these campaigns is worth your own time alongside everything else that you are responsible for. Often at the very beginning this might make sense, especially if your company is bootstrapped and working with a very tight budget, but as the company matures then it may make more sense to pay someone to at least set up the initial ads properly (and quickly) and then report on/adjust them over time. What about you? When did you decide to begin investing in paid acquisition for your company, and how did you decide it was the right time?